I was supposed to post this on the last day of the month. Oops! Buuut, in my defence, I only received my package on Monday and my Colmar post was already scheduled by that time, then yesterday I had to check in for the reading challenge. Today I have no other posts planned though, so I can reveal what was in my final foodie penpals package of 2015. First up is tea and biscuits. A tea advent calendar, containing 24 different kinds of tea bags, and home-made cinnamon waffles, which Jana told me she made using a special waffle maker she inherited from her grandfather. What a special treat for me! 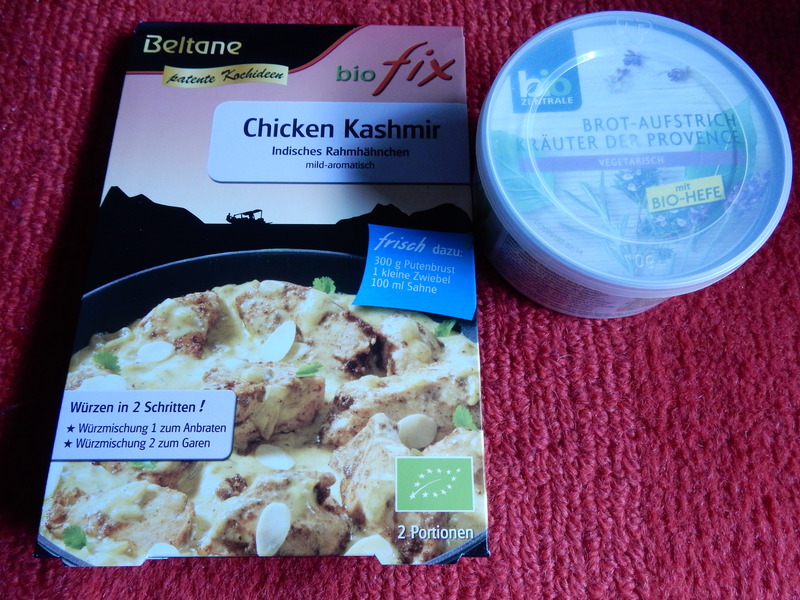 I’ve had Schogetten before, but I had no idea they were from Jana’s area of Germany (the Saarland – specifically, Schogetten are from Saarlouis according to the packet). They look like just chocolate bars, but actually each square of chocolate is separate, for easy portioning. 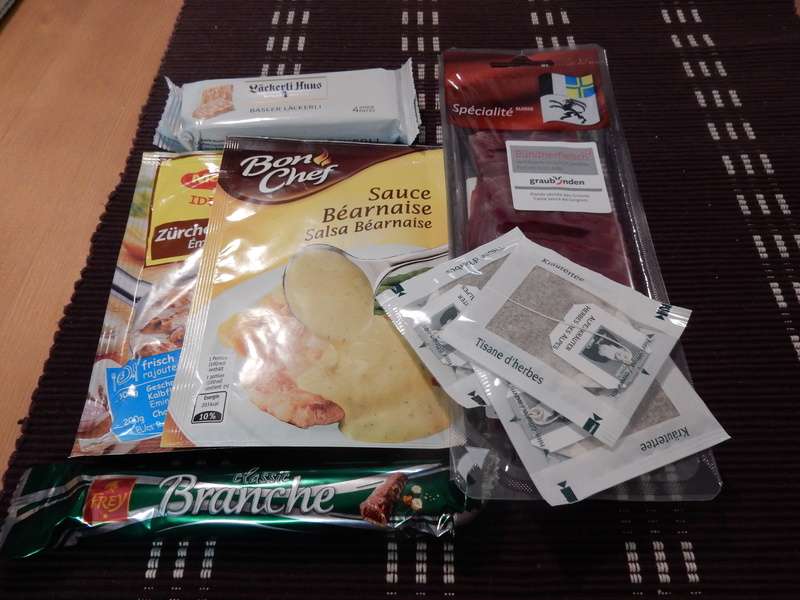 Jana sent me two varieties – Alpine Milk Chocolate and Nougat (with a hazelnut cream filling). Yummy! This is a spice mix for “spice cake”. On the back, there’s a recipe for the cake. It looks very Christmassy and I can’t wait to try it! I have seen Karlsberg beer in the shops, but never tried it. I’ll probably have this at the weekend. A mix for tabbouleh (spell check thinks that’s the English spelling? ), complete with all the spices. All I need to do is add some veg. I love tabbouleh and Migros has an Alnatura section, so if this is good I may end up buying some. I saved the best for last 🙂 This is a jar of mustard. What’s special about it is the little figures – these are the Saarlodris. They’re little cartoon figures that Jana told me are the Saarland version of the Mainzelmännchen – little cartoon mascots of the TV channel ZDF. Jan didn’t know the Saarlodris either, having never lived in that part of Germany (Mainzelmännchen, on the other hand, are broadcast everywhere). Jana wrote that, once the mustard is gone, I should wash out the glass and use it for what, to which Jan said “Yep, that’s what you do with mustard glasses!”. So I guess I learned a new thing about Germany? This was a wonderful end to this year’s foodie penpal packages, and now I’m looking forward to what 2016 has to bring! Carol Anne is taking a well-deserved break in December, but you can sign up now to take part in January. Read the rules and sign up here (This is the European version, for those of you in the US/Canada, the original Foodie Penpals on The Lean Green Bean is here.). 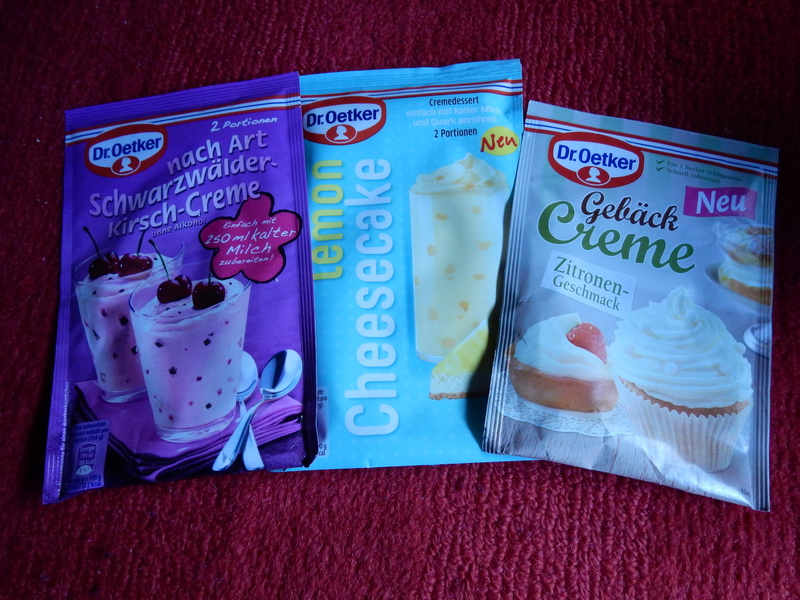 The time has come again to reveal what I received in my latest foodie penpals package. August ended up being a little different – I was originally matches to two people in England, but then the person who was supposed to send to me failed to contact the person who was supposed to send a package to her. Under the rules of Foofie Penpals, if you fail to contact one of your partners by the 13th of the month, you’re taken out of the running for that month and your two partners are rematched to each other. Alie sent my package a little later than the deadline (with my agreement) as she had a trip to England planned and made the offer to also put some British goodies into my package. As it happens, I only had one request so most of the contents were German, but we’ll get to that. 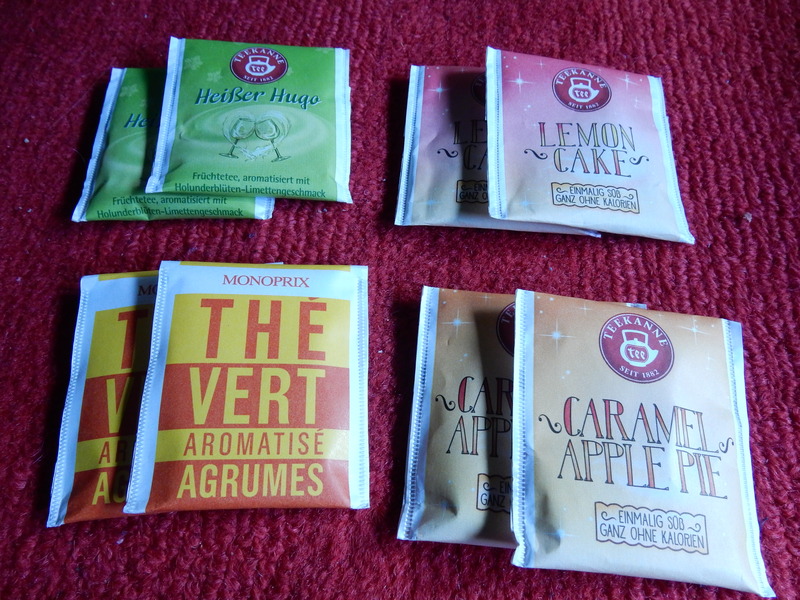 Tea bags! I can’t wait to try them, especially the Caramel Apple Pie ones. They sound perfect for autumn! Apple chips. 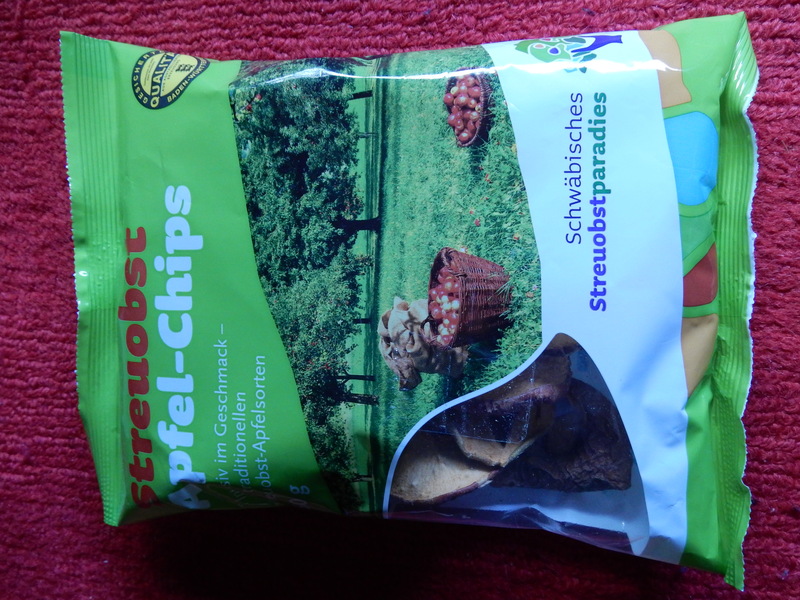 But not just any apple chips – Swabian ones 😉 A nice healthy snack for me to munch on. Sweeties. A Double Decker, which was my one request from the UK (for some reason I really fancied one – and yes, I ripped it open as soon as I was finished photographing my goodies! 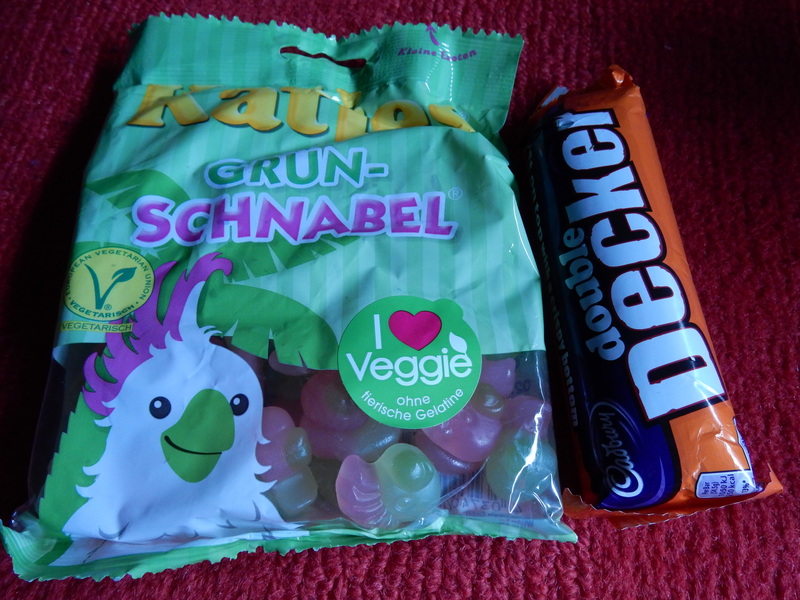 )and Grün-Schnabel (Green beak) gummi sweets. I’ve never tried these, but I love Katja’s pig sweets so these are bound to be yum. An Indian spice mix and a herbes de provence spread. Jan and I both enjoy Indian food and I can’t wait to give this spice mix a try! And I bet the spread will be good on toast or crackers. Just how amazing is that package? I am a very lucky foodie indeed! Alie also sent me a card, and even drew her own little stamp on the envelope. Love it! Jan bought me a recipe book for Christmas entitiled “German Cooking Today”. No, not a hint 😉 but I kept asking him about traditional German foods other than the ones from this region and he didn’t know any, hence the book. I’ve never really done much real German cooking, despite living here for 6 years! The couple of times we’ve had homemade Spätzle Jan did the cooking and for Maultaschen we just buy ready made ones and heat them up. Jan made them once with some friends (before we were together) and apparantly it takes ages! Since we had some baguette left over from the weekend, which had gone pretty stale, I decided it was the perfect opportunity to make Semmelknödel (bread dumplings) using the recipe in my book. I won’t post the recipe here for copyright reasons, but here is someone else’s: http://cookingweekends.blogspot.de/2011/04/semmel-knodel-german-bread-dumplings.html It’s similar to mine, but I had to beat the eggs before adding them to the rest of the mixture.